End of summer Black Cat Blowout! As usually happens around this time of year, the shelter is full of black and black/white cats and juveniles; these are the kittens that are last to be adopted from their litters, the “leftovers” after everyone has taken home the “pretty” kittens. They are the cats that visitors don’t notice, because they are black and are sitting back in the corner watching the visitors play with the “colorful” cats. Every one of these cats and kittens will make a fantastic companion, if they are given the chance! For the month of September, we are having our Black Cat Blowout event; adopt any black or black/white cat or kitten included in the Black Cat Blowout promotion, and pay NO adoption fee! 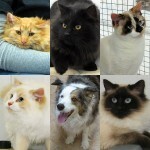 We are placing these fantastic felines on an optional donation basis . . . → Read More: End of summer Black Cat Blowout! Today’s featured kittens: Babbler and Blackbird! Babbler and Blackbird were born on 5/11/12, and came to the shelter as a Stop the Cycle litter; we have spayed the mama kitty, and are now looking for homes for these adorable babies. Mama kitty was pretty young, we think this was her first litter, and the kittens are a little small for their age; they are very healthy and happy, though, and were well socialized with children, cats, and dogs before coming to the shelter. Now they are in a foster home together, and are having lots of fun learning all about the world, practicing their playing skills, and receiving lots of hugs and cuddles. These two had another brother and sister, but they were Siamese mix kittens and illustrate perfectly how much faster non-black kittens get adopted; some lucky people are going . . . → Read More: Today’s featured kittens: Babbler and Blackbird! Dana is a gorgeous male kitty, 8 years old, who joined the shelter when his person had to move and couldn’t bring Dana along. Dana can be a little shy when he first meets people, which makes him a little harder than usual to adopt, but after a few visits, he warms right up to each volunteer he meets… then he will beg for attention to the point he DROOLS while being brushed and petted! Most cat lovers understand the “drooling fool” kitty – Dana is distinguished and attractive, but just watch him embarrass himself when you pet him, HA. In his video, you can actually see him drooling… he’s not a kitty for a “squeamish” person! Siskel (orange) and Ebert (black) were born 3/7/12, and were surrendered to the shelter as a Stop the Cycle litter; the mama kitty has been spayed (thanks to her sponsor who paid for her spay! ), and now it’s time to find homes for these 2 cuties. These kittens are being socialized in a foster home, and should make great pets in pretty much any home. They are doing great with their litterbox training, and are learning all about play-time; they are starting to be less cautious around strangers, too! That little bit of caution will serve them well should they become indoor-outdoor kitties, but they would also do well as indoor-only cats. Visit our Cats Page to see their full listings, including a super-cute video! This beautiful girl is about 3 years old, and needs a special home, where she can experience the “tough love” of The Biggest Loser to help her get into proper feline fitness. She is not happy at the shelter, because we have to keep her in a playpen so she doesn’t eat ALL THE FOOD in the room… she would be a fabulous and talkative companion for anyone, and we know her right person is out there! See her full listing for more photos, video, and application. This handsome black German Shepherd has won the hearts of all the volunteers; he’s such a character, and we love how one ear sticks up and the other ear flops over. See his adoption listing – maybe he is the buddy you’ve been searching for all this time…. 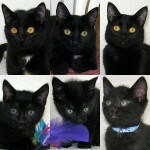 New adoptable cats: 6, all black, from 1 home! These 6 cats are all related; someone didn’t call us soon enough for a voucher, and this is the result. In the top row, Jaguar is about 6 months old; sisters Lea and Piper are about 10 months old. In the bottom row, our three sibling kittens were born 11/11/11. Mama kitty has now been spayed and returned to her owner… now we just need to find homes for 6 black kitties! 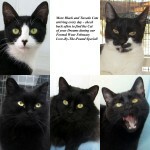 For those who don’t know – black cats are by far the hardest to find homes for, but we will try our best! 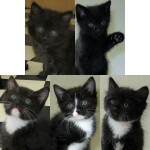 Introducing the newest litter of cuties looking for their new homes. They were born 8/18/11, and arrived at the shelter along with their mama-kitty Miso when the kittens were just 3 weeks old. They and mama-kitty are in foster care together, and the kittens have begun the weaning process (at just over 7 weeks old). They will all be spayed/neutered and ready for release any time after October 27. New Adoptable Pets: our “A” Kittens! This quartet has three black and white brothers, plus a calico sister, all of whom will be ready to go home by the last week of June. They were born 4/27/11, and have been at the shelter since they were 2 weeks old. If you visit our main Cats page you can click on each kitten’s photo to see all the pictures of that kitten, plus a video of the kittens playing. *It’s hard to constantly come up with new names… to help us keep the litters straight, so we . . . → Read More: New Adoptable Pets: our “A” Kittens! Ella is a beautiful, petite mixed-breed “LeMutte” girl, who was found on a forest service road in the Colville National Forest, far from homes and people. No one came to claim her during her impound period, so she is now looking for a terrific new forever home. Her beautiful, glossy black coat, wide forehead, and “otter” tail look like she has some black Labrador retriever in her mix, but we can’t begin to guess what else is in there. She is a medium size dog, with long legs. We are estimating Ella’s birth date as 8/15/10, making her just over 9 months old. She has that frisky puppy energy, and a happy disposition. She is eager to please, loves other dogs, and seems to be very smart. Boulder is a wonderful and handsome black and white guy, full of charm and charisma. He is both playful and affectionate, and seems tolerant of other cats. Boulder was surrendered to the shelter by someone who could not afford to care for him, and we want to find him a great new home full of love and comfort. Boulder was born in March, 2010, so he is just over a year old right now. He would do well as an indoor or indoor-outdoor cat, and should be fine with older children and all adults.